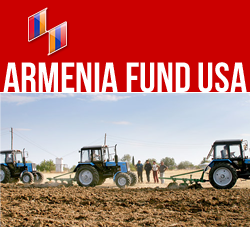 NEW YORK, New York — Hayastan All-Armenian Fund continues to provide vital assistance to the Syrian-Armenian community, which has suffered considerable losses since the start of the Syrian civil war. The Fund launched its aid program for Syrian-Armenians in August 2012, by establishing special bank accounts through which donors worldwide can make contributions in support of the struggling community. The accounts were opened on the recommendation of Armenian president Serzh Sargsyan, who also serves as the president of the Hayastan All-Armenian Fund Board of Trustees. To date, with donations made through these bank accounts, the fund has underwritten the Aleppo-Yerevan-Aleppo air travels of Syrian-Armenians who seek refuge in Armenia, and carried out much needed medical and educational projects. Through the latter two types of initiatives, which were proposed by Armenia’s Ministry of Diaspora, the fund has sponsored emergency surgeries for two Syrian-Armenians, and continues to cover the annual tuitions of 69 Syrian-Armenian students who currently attend various colleges and universities in the homeland.